A park commemorates Thomas Leslie Axford who was awarded the Victoria Cross (V.C.) and the Military Medal (M.M.) during World War One. On the 13th April 2015, an additional plaque was unveiled on the war memorial to acknowledge Thomas Axford after whom the park is named. Funding was received through the ANZAC Centenary Grants Program. Axford’s battalion was in the centre of the 4th Brigade’s assault and its task was to clear Vaire and Hamel Woods in World War One. As the Australians advanced up a slope they encountered heavy fire from the German front line. The adjoining platoon to Axford’s was delayed by the uncut wire, suffering many casualties. Axford rushed in from the flank to assist. He jumped into the enemy trench and bombed and bayoneted the machine-gun crews, killing ten enemy and taking six prisoners. He threw the machine guns over the parapet and called the delayed platoon forward before he returned to his own platoon with which he fought for the remainder of the operation. He had previously helped lay out the assault line tapes which were within 10 metres of the enemy. He was awarded the Victoria Cross for his actions. 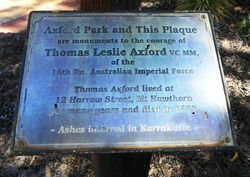 Axford Park and this plaque are monuments to the courage of Thomas Leslie Axford VC MM of the 16th Battalion, Australian Imperial Force. Thomas Axford lived at 12 Harrow Street, Mt Hawthorn for many years and died in 1983.